Cool-Pitch Pitcher Chiller keeps beer cold! 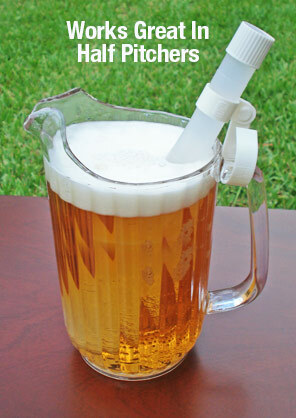 Keeps beer & other beverages chilled without diluting the taste with ice! Cool-Pitch™ Company manufactured the first bat-shaped pitcher chiller in 1993. Today, there are other manufacturers that sell knockoffs (from China) that break. These cheap imitations can’t compare to the Cool-Pitch™ which has a 2-Year Warranty on all components! Easy to use—Just add water, freeze, place in beverage, and hook to pitcher’s handle. Efficient—Keeps the temperature of beverages under 40⁰ F for 90 minutes. Versatile—Adjustable Hook fits all pitchers and stays in place while pouring. Durable—2-Year Warranty on all parts. Copycat products break with just a few uses. Sanitary—Constructed entirely of FDA approved materials. Neat—Replaces messy, makeshift devices such as bags and cups of ice. 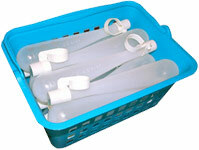 Convenient—Each dozen includes a Storage Basket and occupies a space of only 12”x8”x4”. The Cool-Pitch™ is available in quantities of twelve (called Dozen Paks). (to replace the broken hooks of knockoffs).